Mike Trick's Operations Research Blog : Operations Research: Growth Industry! 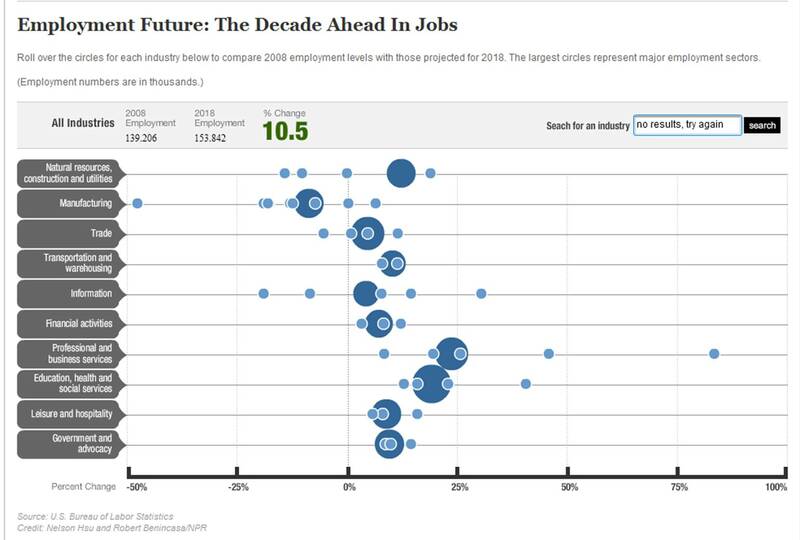 NPR has a nice graphic for where job growth will occur in the next decade based on US Bureau of Labor Statistics data (the NPR site is much cooler than the graphic above). Now, operations research is a little small to appear as a dot on its own, but if you look at that little dot far to the right, showing the most job growth? That is “Management, Scientific, and Technical Consulting Services”. And what field is all of “management, scientific and technical”? Operations Research, of course! The projection is for 82.8% growth. There are some other interesting dots that might guide those in our field. Note the big dot second from the top. That is Manufacturing, with a 9% loss in jobs. Some of that might be due to efficiencies from our field, but I suspect most is due simply to a shrinkage in importance of manufacturing to the US economy. Some of the big growth areas? Education, health care and construction with growth in the 15-25% range. This suggests that applying operations research in the service industries is going to be a big driver of growth in our field (unless we miss the boat and let another field do operations research there under a different name). Thanks to the INFORMS Facebook Page for the pointer! Posted by Michael on Tuesday, January 19, 2010, at 4:26 pm, and filed under Blogs and Web, Jobs in OR. Follow any responses to this post with its comments RSS feed. You can post a comment or trackback from your blog.